Bing's Bitcoin conversion tool at work. Bing is highlighting bitcoin currency conversions at the top of its search results, the Microsoft-owned search engine said Monday. The conversion works for more than 50 currencies. Search for, say, "200 dollars to bitcoin," and "0.29 bitcoins" will appear prominently as its own result at the top of the page. A search for "200 rubles to bitcoins" produces the answer, "0.0089 bitcoins." Bing incorporated currency conversions into its search engine years ago. But the bitcoin conversion is a new feature, deployed just as the nascent digital currency "makes headlines and captures the world's attention," Bing said. "Bitcoin has been highly discussed and people are looking for information on it," a Microsoft spokesman said via email, calling the feature a simple way to help people get the information they're looking for. 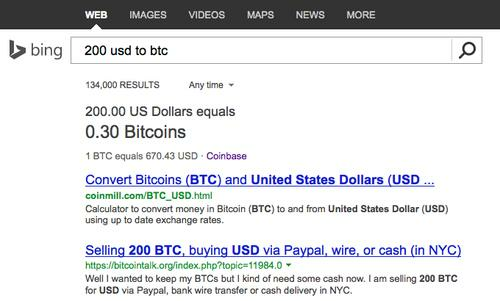 It's a functionality not offered yet by Google, which shows links in its search results to bitcoin-related conversion questions, but they're not picked up by its currency conversion tool. Bing's data comes courtesy of Coinbase, one of the most prominent Bitcoin-related startups. The company offers a range of Bitcoin services, including an exchange for buying and selling bitcoins, a payment processor and a so-called wallet service for storing bitcoins. Coinbase offers an API (application programming interface), allowing others to integrate bitcoin payments, or other data, into their website or apps. With Bing tapping its data, Coinbase said Monday it would allow real-time search of bitcoin value. It's important for the tool to offer real-time data, given Bitcoin's volatility. On Monday, the value of bitcoins was changing by several dollars from minute to minute, following word from the Mt. Gox Bitcoin exchange that a flaw in bitcoin software makes it possible for fraud to occur. Mt. Gox suspended trading last week after it found an unusual level of transaction activity on its site.